Bay Area public school districts planned to close Friday and a number of universities canceled classes this week as a result of smoke-filled air moving into the region from the Camp Fire to the northeast. Offshore winds that helped fan the flames of the state's deadliest fire in Butte County are "bringing the smoke right in," said Kristine Roselius, spokeswoman for the Bay Area Air Quality Management District. "We are asking people to stay indoors with their windows and doors closed," she said. K-12 institutions shutting their doors Friday include all public schools in Alameda County — including the Oakland Unified School District — and the San Francisco Unified School District. "The safety of students and staff is paramount and the poor air quality conditions throughout the Bay Area made this a necessary step," said L. Karen Monroe, superintendent of Alameda County schools. San Francisco State, San Jose State and Santa Clara universities said in statements that they're shutting down classes from Thursday through the weekend. The University of California, Berkeley, on Thursday afternoon announced plans to "cancel all classes for the remainder of the day today, and on Friday." Representatives from Stanford University did not immediately respond to an inquiry about its status. 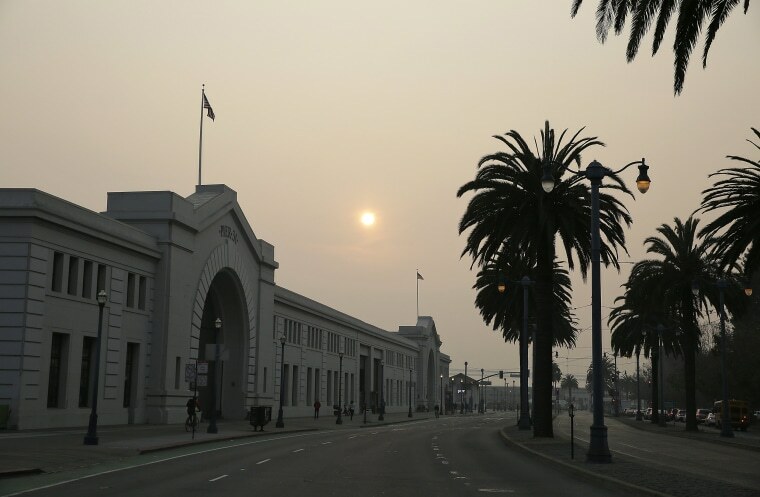 The Bay Area was under a "Winter Spare the Air" alert through Tuesday: That prohibits wood fires in an effort to keep the air from getting worse. Air was said to be "unhealthy" Thursday, according to the AQMD. Roselius, of the Bay Area Air Quality Management District, said air monitors have registered high levels of particulate matter that could cause some children and the elderly to suffer breathing issues, especially if they have asthma. For now, Roselius said, "You really can't see the city from the other side of the Golden Gate Bridge." She was hopeful that a forecast shift to onshore Pacific winds would clear the air.